Padded Task Chair Is Ideal For Computer Labs, Teacher Chairs Or Office Settings. Polyurethane Padding On The Seat And Back Delivers Extra Comfort For Long Work Days. The 5/8" Thick Padding Is Covered With Fabric That Matches The Seat Color For A Professional Look And Is Bonded To The Shell. One-Piece, Molded Polypropylene Shell Offers The Classic Classroom Look, But Is Enhanced With Versatile Frame. The Gas-Filled, Pneumatic Cylinder Allows A Seat-Adjustment Range From 18-1/4" To 22-5/8" High. Armless Task Chair Swivels 360 Degrees And Rolls On 2" Diameter, Dual-Wheel, Hooded, Swivel Casters On The Five-Star Base..
Padded Task Chair Is Ideal For Computer Labs, Teacher Chairs Or Office Settings. Polyurethane Padding On The Seat And Back Delivers Extra Comfort For Long Work Days. The 5/8" Thick Padding Is Covered With Fabric That Matches The Seat Color For A Professional Look And Is Bonded To The Shell. 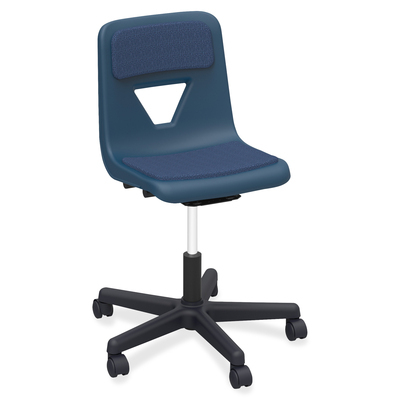 One-Piece, Molded Polypropylene Shell Offers The Classic Classroom Look, But Is Enhanced With Versatile Frame. The Gas-Filled, Pneumatic Cylinder Allows A Seat-Adjustment Range From 18-1/4" To 22-5/8" High. Armless Task Chair Swivels 360 Degrees And Rolls On 2" Diameter, Dual-Wheel, Hooded, Swivel Casters On The Five-Star Base.